While radical Islamists are destroying churches and archaeological treasures in Iraq and Syria, Muslim Palestinians have unveiled the first stage of a restoration of the Church of the Nativity in Bethlehem. The project, partially funded by the Palestinians and conducted by a team of Palestinian and international experts, is the biggest restoration at the iconic church in some 600 years. The removal of centuries of dust has left Crusader-era mosaics sparkling in sunlight filtering through brand-new windows. Structural repairs on the fragile rooftop and windows have been completed and art treasures have been returned to their delicate elegance. Palestinians, who are overwhelmingly Muslim but include many Christians as well, consider the church a national treasure and one of their most visited tourist sites, ABC noted. President Mahmoud Abbas has been actively involved in the labor of love, the news outlet added. 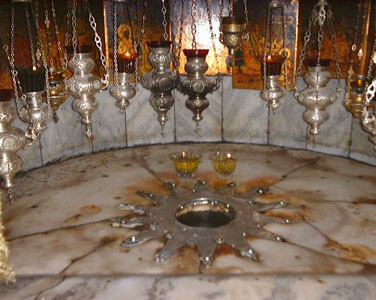 The Church of the Nativity, located in the biblical West Bank town of Bethlehem, was built by St. Helena in the fourth century over the grotto where the Virgin Mary is said to have given birth to Jesus. Then, in 2013, the Palestinian Authority, the internationally backed self-rule government, took the lead in financing the restoration. The rest has come from the Palestinian private sector, the Roman Catholic, Greek Orthodox and Armenian churches and other countries. Al-Bandak said nearly eight million dollars has already been spent. (Reports say that the three Churches agreed to cooperate only due to the neutral leadership of the Palestinian Authority – historically it has been hard to get them all to agree to work in the holy places! – fcz). Mimmo Nucatolo, who heads the Italian team restoring the mosaics, called the gold, green and pastel artworks “a unique example” made by skilled mosaicists at the end of the Crusader period. But he said that after centuries of neglect, the mosaics were in such a bad state that they almost disappeared from sight.